Well, I came back from OLF 2009 with a lot of audio and a lot of notes. I’m hoping to release at least most of the audio, but it might take a while. I got a decent recording of the Friday night “podcasts! hosts and listeners unite!” talk. This is the one where Randy and Janet were supposed to get married. They did get married, but it didn’t happen until later. If you don’t know what that means, listen to the Tech Show, episode 316. Anyway here’s the audio, which unfortunatley starts in the middle of 3thirty introducing himself. It’s only 5 minutes long, but as far as I know, nobody has any other OLF audio out yet. Enjoy. This entry was posted in Linux on September 28, 2009 by Jeff. Wow. Time just slips away. I’d hoped to mention the Ohio LinuxFest before the day it starts, but I’m running a bit behind. As I have since 2005 I’ll be at the show this year. I’m heading up today, hoping to catch some of the early talks or just hang out. This year I’m bringing my new Tascam DR-07 and hoping to get some interviews. Every year I take a notebook to take notes at the talks hoping to do something with them. I’ve still got 4 years worth of notebooks laying there. I guess it’s nice to have a record of the talks, but I give up on the idea of transcribing them. Anyway, if you’re going, look me up. Should be tons of fun, as always. This entry was posted in Linux on September 25, 2009 by Jeff. The trails themselves where as advertised: quiet. We saw no one the whole time we were there. There is a big green mailbox near the trailhead that holds maps, a clipboard to register your visit and lots of roaches! We did find one trail (the westernmost leg of the Deep Hollow trail) that was blocked by downed trees. We never found the trail again and wound up taking a compass bearing and hiking off trail until we got back to the truck since we were just 50 yards out. Otherwise the trails are clear and mostly well marked. After hiking the main trails we decided to do the short out-and-back White Tail Rest trail. Near the end, my partner stopped me and whispered “hey look over there.” After a few seconds I made out a donkey through the trees. 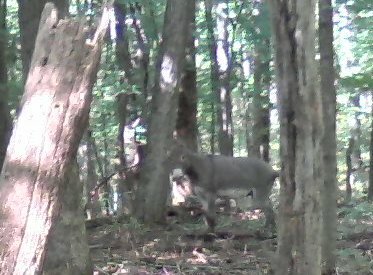 I’ve seen deer, rabbits, snakes and lots of other things on hikes, but never a donkey. I checked later and they’re not native to the forests of Kentucky, so this one must have gotten loose from a nearby farm. I tried to slowly move close enough to get off a couple pictures with my camera phone. When I got closer than 30 feet it started snorting, twitching its ears at me and eventually moved farther away. I had a spare apple in my pack so I tossed it in the donkey’s general direction and headed back. Here’s the best shot of the 2 I took. This entry was posted in hiking, Life on September 21, 2009 by Jeff.